Earlier this week, I was talking to my partner regarding a small contest or giveaway that I'll be posting within the week. He had amazing ideas and suggestions. 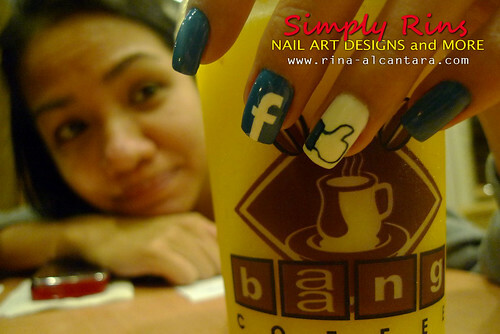 One of which is this nail art he thought would look great as a backdrop for the welcome page of Simply Rins' Facebook. 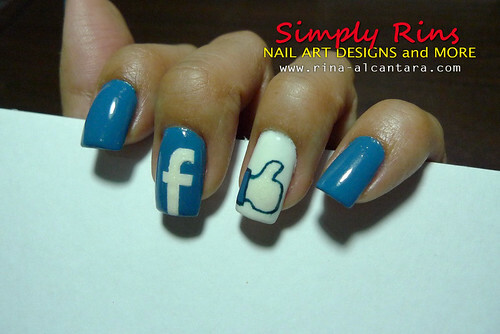 Facebook nail art by Simply Rins! This nail design have 2 accent nails. But instead of having an accent nail on both hands, we (my partner and I) decided to have it on 1 hand. I used 2 coats of OPI Suzi Says Feng Shui as base color. Among my stash, I found this shade the closest to the the Facebook blue color. I used 2 coats of Essie Blanc on my left hand's ring finger. 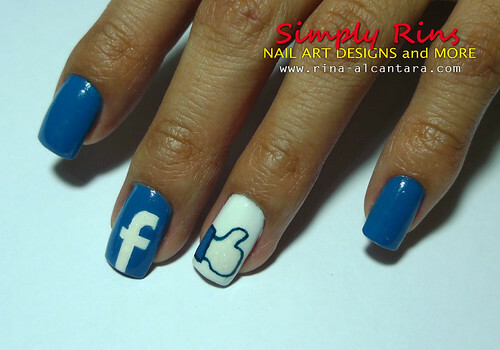 I painted the Facebook logo on my left hand's middle finger with Lucidarling white. I must say, I really love this polish. It has subtle shimmer and looks good whenever I need a not so white color for a design. I already bought an extra bottle of this nail polish. I painted the Facebook "Like" logo, a thumbs up sign, on my left hand's ring finger using OPI Suzi Says Feng Shui for the sleeves and Lucidarling white for the hand. I then outlined everything with OPI Ski Teal We Drop. We had fun with this nail art during our day together. He took pictures of a few things I "like". Baang Coffee! Still my favorite hang out! 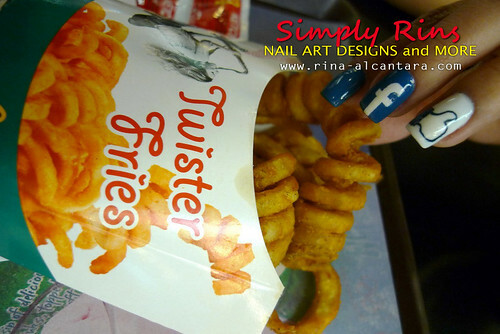 Thanks to my partner, you may now view the new look of Simply Rins' Facebook page by going to http://www.facebook.com/simplyrins. If you have liked us already, thanks so much! Hahaha thats super cool! great fan art! i noticed youre following (= tyvm!! i was scanning through your older entries.. youre incredible! such unique, original, well-execute ideas-love your nail art! 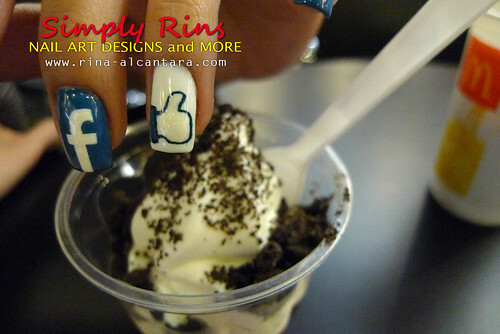 lol... i love this mani! I've tagged you on my blog for the stylish blogger award. *clap clap clap* ang galing galing!